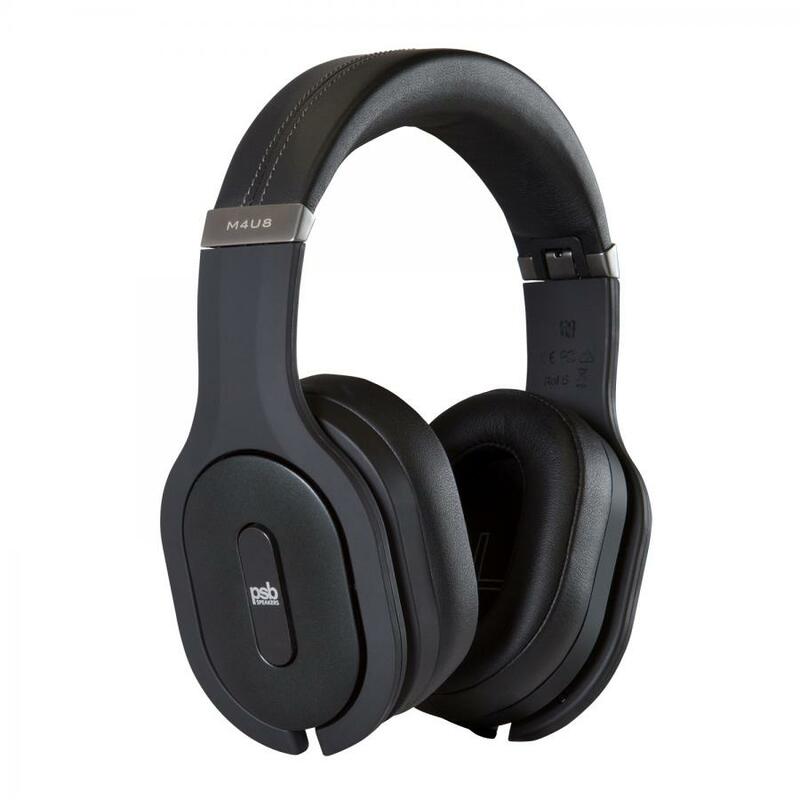 The catchily named M4U 8’s are the newest noise-cancelling headphones from Canadian manufacturer PSB and follow the well-received M4U 1 and M4U 2 models. 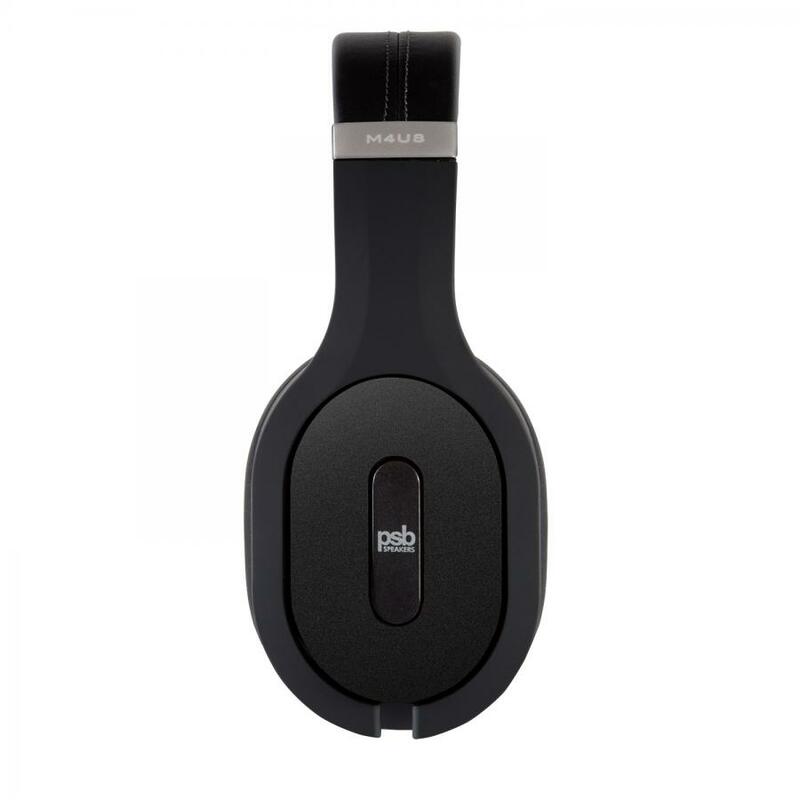 Unlike previous iterations, these are wireless, connecting to devices over standard Bluetooth or the new fangled aptX. The M4Us aren’t going win awards for visual appeal, but they do have a certain understated style, with headband and cups rendered in black matt plastic, while the sturdy hinges are finished in chrome. The luxuriously soft ear-cups are covered in black leatherette so that donning them feels like sinking into a mid-market Italian sofa. I’ve worn them for a couple of hours each day without any comfort issues, though I will note that they are tightly fitted. If you’ve a generously-sized skull you could struggle, but if you’re a runner you might appreciate the firm fit. They have a reassuringly expensive-feeling weight in the hand, and are solidly constructed. A closer inspection reveals a thoughtful attention to detail. For example, the rechargeable AAA batteries give 15 hours of playtime, and are replaceable, so battery fatigue isn’t a problem. If you do run out of juice, the box contains an audio cable so that you can continue to listen in passive mode. Handily, both ear cups have an audio jack so that you can wire them on whichever side is most convenient. This thoughtfulness extends to the controls: three rocker switches on the right ear cup which control volume, mode, and track selection respectively. Having quick-access is particularly welcome in a wireless headphone since it means my phone can stay tucked away in my pocket while I skip to the next track or turn up the music. Pressing the track selection switch pauses the music or answers an incoming phone call, and there’s a microphone on the underside of the ear piece for hands-free gossip. The middle rocker switch controls the power and active noise cancellation. This works remarkably well, flick the switch into the ANC position, and the world around you is muted. There’s no hiss to speak of, just a strange sensation of pressure on the ear drum. A busy London street recedes into near silence making me doubly cautious crossing the road. When something is loud enough to puncture the bubble – a knackered motorbike roaring by – the effect is oddly jarring. I’m always genuinely surprised at the end of a train journey when I take off the cans and realise just how loud my surroundings have been. On the underground they fare equally well, with the clattering of the Northern line more noticeable in my feet than my ears. Pressing the volume control switch disables the noise cancellation and mutes the music so that you can hear the environment. Thoughtful, sensible, clever. They’re no slouch in the sound quality stakes, either. As though to match their sensible exterior, the sound on the M4U 8’s is unfussy and well executed. The low end is punchy and weighty without being overdone and they’re capable of bags of detail, having great separation even on busy tracks. They can sound a little boomy at high volume, but the noise cancellation and deft fidelity mean you shouldn’t need to crank them up too high even in the noisiest environments. It’s tough to express how marvellous it is to listen to music quietly on the underground, carried along in a bubble of silence. I was initially worried that the tight fit and muffling effect would make them sound claustrophobic but, in practice, they impart a great sense of space. They’re all the more impressive when you remember that these are wireless headphones, streaming from a phone, capable of audiophile sound. When I last checked, we had four hundred and thirty seven pairs of headphones in our house, most hidden in a kitchen drawer, or stashed behind the sofa. I wasn’t thrilled by the appearance of number four hundred and thirty eight, but PSB have won me over with clever ergonomics and great portable performance. All in all these are an easy recommendation – great sound, neat design, and adequate noise cancellation in a portable, wireless package.